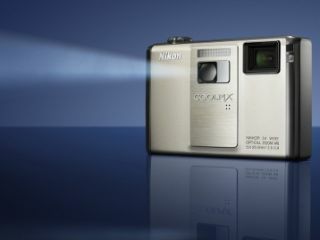 Nikon has announced a world's first for the camera world – a compact coupled with a built-in projector. The Coolpix S1000pj is a move that's certain to shake up both the projector and camera market, Nikon believes that the camera can project images up to 40 inches in size (and as low as 5 inches) and there's also a remote control in the package, so you can set up your own image slideshow on the go. The camera itself holds a 12MP sensor, 5x optical zoom and a 2.7-inch TFT LCD. ISO levels can be cranked up to 3200 at full res. As with every compact out at the moment, you can reduce image blur in-camera and there's also a whole host of other features, including a Skin Softening function – which will make your leathery looking grandmother look like Cameron Diaz in no time. The Nikon S1000pj is out in September and will set you back £399. And if you want to read if it's any good, the folks at T3 online have been busy and put up a hands-on with the camera already.